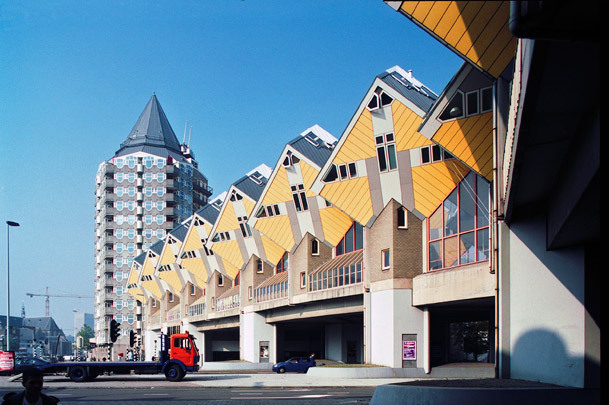 The Amsterdam architect Piet Blom spent years working on his concept of an 'urban roof' of housing with the Kasbah in Hengelo (1973) and cube houses in Helmond (1976). The third manifestation of this theory, Blaakse Bos (Blaak Woods), is part of a plan for Oudehaven. Blom felt that this former harbour area's only chance of success would be if it were to be linked to the market and the central library by a Ponte Vecchio-type pedestrian bridge across Blaak and its traffic. Only 38 of the projected 74 cube houses were built and the steep climb across Blaak was not a great success. A residential tower, the Pencil, was built to compensate. The development on Oudehaven itself combines 250 social housing units with cafés and restaurants along the dockside walkway. The whole has a high structural density and a 'Mediterranean' vernacular and being ideally oriented to the sun has burgeoned into a popular leisure zone for tourists and students. Cube houses, also known as pole or tree dwellings, consist of a tilted timber cube with one point anchored in a hexagonal concrete core. This 'trunk' contains the entrance and the stair. The cube itself has three levels: a 'street-house' of kitchen and living room, a 'sky-house' of bedrooms and a 'tree-top-house' at the apex. The only vertical walls are in the core; all the others are at an angle.